Tag line: "The Supreme Adventure in Terror!" In the 1960s, Roger Corman turned out a number of films based on the writings of Edgar Allan Poe, none of which were particularly faithful to their source material (the lone similarity between ‘61s The Pit and The Pendulum and the Poe short story occurs in the movie’s final act). 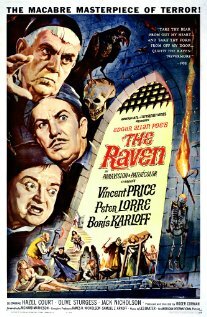 The Raven, released by American International in 1963, is no exception. Save a few lines from the poem (spoken at the beginning by its star, Vincent Price) and the fact a main character was once married to a now-deceased maiden named Lenore, The Raven travels a very different path than the one laid out by the great writer. While resting at home one evening, retired magician Erasmus Craven (Price) hears a tapping at his window. Upon investigation, he notices a raven sitting on the ledge. Yet this is no ordinary bird, as he’ll soon discover; it is, in fact, a colleague of his, Dr. Bedlo (Peter Lorre), who claims he was transformed into a raven by master conjurer, Dr. Scarabus (Boris Karloff). After restoring Dr. Bedlo to his original form, Craven learns Bedlo had opposed Scarabus in a magician’s duel earlier in the evening. Not only that, but Bedlo also insists he saw Craven’s allegedly deceased wife, Lenore (Hazel Court), alive and well at Scarabus’ castle! His curiosity piqued, Craven agrees to accompany Bedlo, who intends to challenge Scarabus to a rematch. Joined by Craven’s daughter, Estelle (Olive Sturgess), and Bedlo’s son, Rexford (Jack Nicholson), the two set out to confront the sinister Dr. Scarabus, who, in spite of his advanced age, remains a formidable adversary. It may sound ominous on paper, but Corman’s The Raven is actually a very funny movie. Abandoning the solemn themes of heartbreak and the afterlife that spurred Poe to write The Raven in the mid-1840s, Corman tells the tale of a trio of elderly magicians trying to out-do one another, often with hilarious consequences. Peter Lorre delivers a frantic performance as the stubborn Dr. Bedlo, a noticeable contrast to the more reserved turns by Price and Karloff, yet it’s he who gets the majority of the film’s laughs (while still in raven form, he asks Craven for a glass of wine. When Craven offers him warm milk instead, Bedlo, a known alcoholic, shouts “Milk! How vomitable!”). Lorre’s Bedlo also possesses a sharp tongue and a short temper, tossing out insults aimed at not only Dr. Scarabus, but his own son as well, played by a very young Jack Nicholson. In an early screen appearance, Nicholson here displays none of the charisma that would eventually net him three Academy Awards, and nine additional nominations. Actually, his performance is downright lifeless. In Jack’s defense, though, he was only there to serve as straight man for his three senior co-stars, who, quite appropriately, are given all the best lines. Those seeking a thoughtful, somber cinematic translation of Poe’s classic verse will have to look elsewhere. But if its laughs you’re after, The Raven will certainly do the trick. It's interesting to think of the (entertaining) schlock that he put out being mixed with great films like this. I underestimated him.